The 20L red Waterproof Dry Tube Bag from OverBoard is used to protect your digital cameras, valuables, and other gear against the elements. 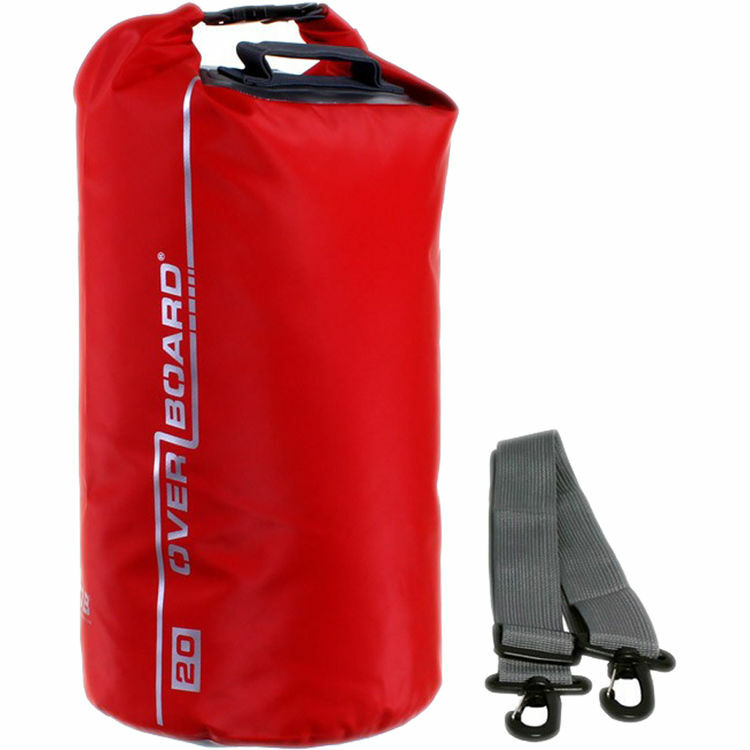 It is a 100% waterproof, roll-top dry bag with an OverBoard Fold Seal System. It will float in the water when properly closed and is constructed from durable, 600D PVC tarpaulin. It's equipped with a carry handle and a removable shoulder strap. Box Dimensions (LxWxH) 18.0 x 9.0 x 1.0"
Waterproof Dry Tube Bag (20L, Red) is rated 4.4 out of 5 by 7. Rated 5 out of 5 by Dolkin from Kept my valuables clean and dry I bought this bag to keep my camera (D7000) and a couple lenses dry while I float the Methow River fishing. I had the camera body, an 18-105mm, a 70-300mm and a 50mm along with 2 towels and my wallet and cell phone. There was still plenty of room in the bag for more. I wanted to leave some room so I could introduce air to help with floatation in case it went overboard. I had to be a bit creative strapping it down as it isn't designed to be lashed, but more carried. Even after being blasted with a giant water canon my stuff stayed dry. It kept the sand and debris out as well. Great bag! I'll be getting at least one more for my sleeping bag. Rated 5 out of 5 by Anonymous from Great inexpensive yet high quality dry bag! I bought this to use while on tropical vacations, to keep my camera, phone and other stuff dry while on boat trips. This bag is great. Light weight, holds a lot of stuff and has kept my stuff completely dry. As a bonus it also works great on the beach to keep sand out. It holds my camera and phone, along with a change of clothes for my and wife and I, lightweight jackets and at least 1 beach towel. It comes in a plastic sleeve and folds flat so it takes up very little space in your suitcase. The shoulder strap is a nice feature. It was one of the least expensive dry bags out there and is very high quality. It doesn't have any inside pockets like some of the more expensive dry bags, but it does seal up air tight when the top of the bag is folded properly. I'm glad I bought it and would recommend it to a friend. Rated 5 out of 5 by Tunedaddy from Zion Narrows I used this in hiking the Zion narrows and fortunately did not have to test it out. But it's nice to know that had taken a dip my D800E would've stayed dry. It was wrapped in a towel so even if there was a slight leak it would've been protected. When I sealed it up it appeared that a temporary plunge would not have resulted in much, if any water in the bag. Rated 5 out of 5 by Sinerje from Awesome bag Great size. We fit two pair of jeans n shoes, beach towel. Didn't get chance to get it wet so not sure about the waterproof feature. Bag is very sturdy. Shoulder strap is a very useful feature but probably need to add a padding to it because the bag got bit heavy from carrying it around. The bag itself is lightweight. Rated 5 out of 5 by Anonymous from Great Product This is a great product, large enough for a bunch of equipement, camera lenses, and its well designed too! No point in going for the smaller one. Does anyone know if this bag can hold a NIKON D90 or 7000 with a battery pack and a 80-200 mm zoom safely? Could you put a padded camera bag inside? Yes I put my Cannon rebel in a lowe pro padded bag inside and no problems. Perfect for better camera on a kayak/whitewater trip.